If I had to name the one thing I know I need more of in my life, it would probably be physical self care — activities like stretching and foam rolling and restorative yoga. I don’t know why I resist it so much when I know it’s so, so good for me. I guess, by the time I’m done with whatever hard, sweaty workout I’m doing, I just want to go home already, you know? So it only makes sense that I am a big fan — huge! — of having tools at home to help me get that very necessary self care work done. And it probably won’t surprise you too much that I want to share the things I’m digging. Maybe they’ll be a fit for your fitness routine, too! 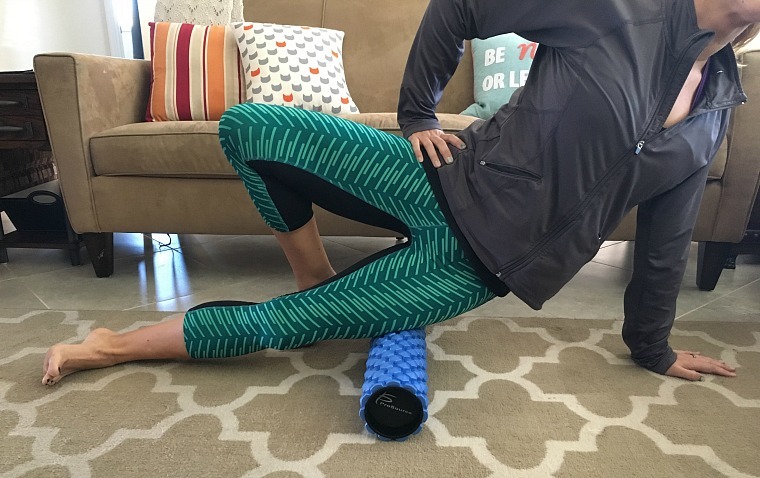 There’s nothing that hurts so good as using a foam roller — nothing. But depending on the exact part of your body you’re trying to work, you might find that you could use a longer roller or a shorter one. Or maybe you’re traveling and want to take it but can only fit a short roller in your bag. Problem solved! This 2-in-1 Hexa Massage Roller ($39.99) isn’t a newbie’s tool — it’s best for those who are familiar with foam rolling and looking for a pretty deep massage, because HOO BOY does it deliver. It has firm but flexible slightly raised bumps designed to promote deeper self-myofascial release (oh, yeah, talk dirty to me), and the core is solid foam that feels super duper durable. I literally tossed out my old, overused, broken down roller immediately after using this new guy. Soooo legit. Okay, bear with me while I get a little bit science-y. You probably know that standing on different types of surfaces activates different muscles all over your body — that’s why we use things like stability balls and BOSUs and foam blocks during strength training. They get us slightly off balance and we have to compensate. But how much thought have you given to the signals your feet — your bare feet — send to your brain when you’re standing on, say, your yoga mat? The brand new Naboso Yoga Mat ($110) was created by Dr. Emily Splichal, and both the mat’s density and texture are designed to target the small nerve proprioceptors on the bottoms of the feet. Those nifty little proprioceptors influence our posture and have a direct effect on our movement. Now, I have to say that my personal experience with the mat is a bit varied. 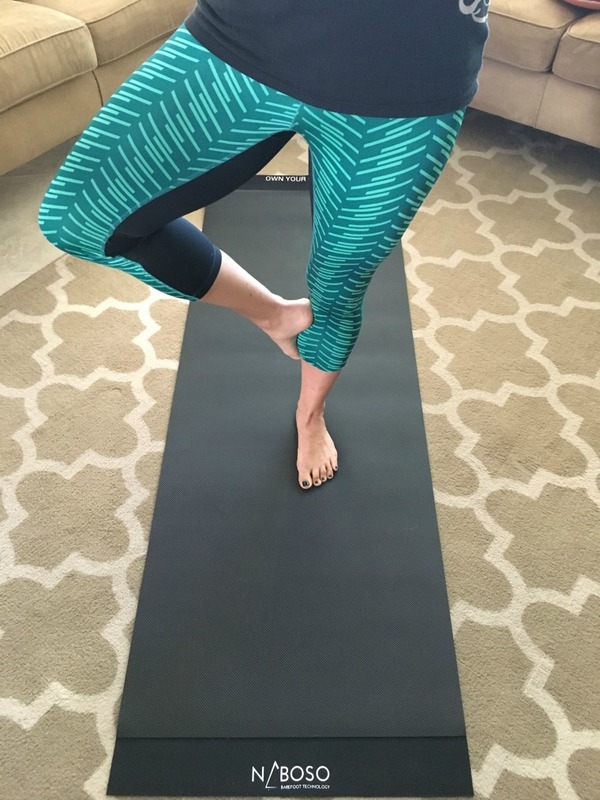 I definitely notice the balance benefits — the texture is far different than any other yoga mat I’ve used, and I do experience added stability. However, as you might remember, I am typically a sweaty mess — grip on yoga mats is a constant problem for me (which is why I tend to use a yoga towel over most mats), and that’s definitely true here. But, of course, tossing a towel over the top of this particular mat sort of defeats the purpose of the texture. So! I really like it for balance work at home, but it’s not my go-to for hitting a class. I have several foam rollers that are life savers and can’t live without them. 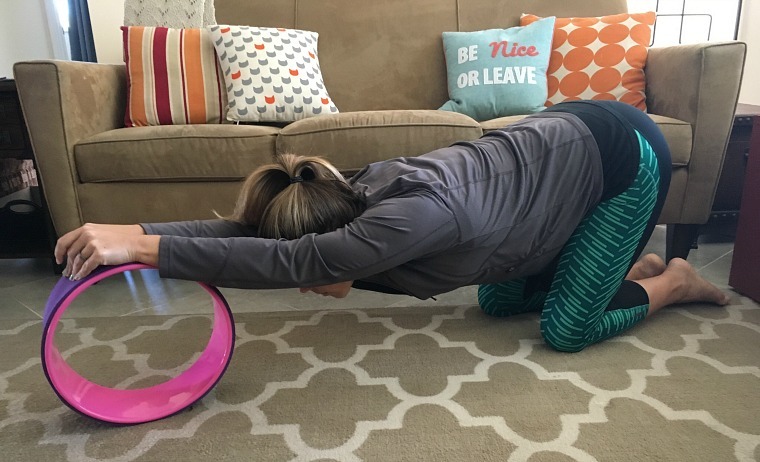 I won a yoga wheel in December and just love it! It really helps with my back bends but you really have to try it to see the benefits! That yoga wheel looks amazing. I love stretching and I’m always trying to improve my flexibility – I might have to invest in one! My foam roller looks very similar to that one as well, I 100% recommend them!